The Common Rail Diesel Engine (CRDI) improves fuel efficiency while reducing noise levels. With this eco friendly Tier 4 engine, the DK10SE Series offers the operator a quiet work environment with powerful performance. 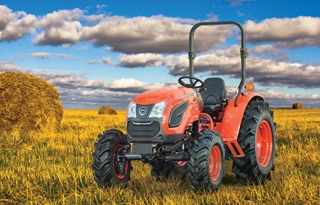 All models feature performance proven, heavy-duty HST drives that deliver power and efficiency. The three range transmission (Hi/Mid/Low) with twin pedal operation makes your job easier, smoother and safer. With several models featuring a factory-installed cab with A/C and heat, operators can perform tasks comfortably through the year.